I’m glad I got the question early because at first it was a difficult one to answer. I was not much into reading fiction in my elementary years. Non-fiction was my specialty. I loved the fact that I didn’t have to read a book in order or read every line – only what interested me. But what they want is a title that I can hold up and show a classroom of 4th, 5th, and 6th graders. I scanned my brain and visions appeared of me reading the newspaper with my dad. He was a journalist and each morning a newspaper was delivered to the porch, and at that time we had two daily papers competing for our attention. Plenty of reading material. Who had time for books? Since I’m not going to hold up a newspaper I had to dig deeper for the book that hooked me on fiction. In a guest bedroom there is a stand-alone four-shelf bookcase. It is filled with books I’ve read but haven’t given away. Many times someone asks to borrow a book from these shelves and I always say yes with the condition they don’t give it back and share it with another reader after they are finished. I glanced at the titles, some old some new, and in the lower corner were three books, the ones that got me reading fiction. Yes, The Hardy Boys. I was in 5th, maybe 6th grade and a friend said I had to read the first one. I did and liked the exciting sleuthing tales of Frank and Joe Hardy so much I read the next two within a week. But then I stopped. By the time middle school began I got interested in other books and never returned despite having 187 sequels to choose from. The series is still popular worldwide today, but I’ll stay with the first three, the ones that sparked my love of fiction. The author, Franklin W. Dixon, never existed. All the books since their inception in 1927 were written by ghostwriters. Next month Simon and Schuster will release the eighth book in the HARDY BOYS ADVENTURE SERIES titled DECEPTION ON THE SET. These books are different from the originals as they are told with alternating first person POV. The originals were all third person. Thanks Frank and Joe and whoever is writing your current volumes for encouraging boys to read. 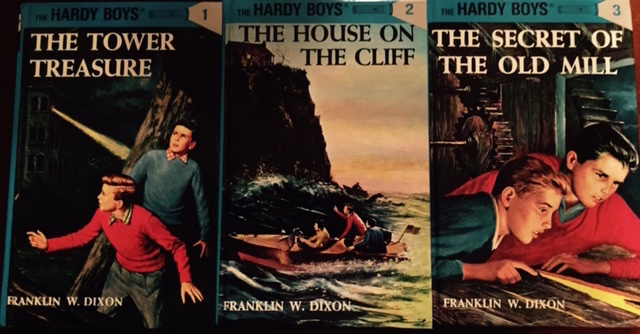 This entry was posted in Reading and tagged Franklin W. Dixon, Hardy Boys, Middle grade, reading fiction. Bookmark the permalink. 5 Responses to What book started your love of reading? I don’t remember ever NOT loving to read fiction. I always had a book with me and still do. 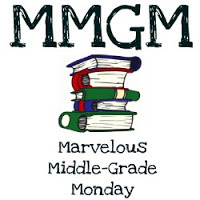 I did love the Nancy Drew books, the flip side of Hardy Boys, but I would have to say when I read the title of your post, the first book that popped into my head was Caddie Woodlawn, followed by all the Laura Ingalls Wilder books and the Anne of Green Gables books. I think those really cemented my love of reading. I LOVED The Hardy Boys. My mom always read them to me and my bro when we were little. I also fell in love with writing because of Nancy Drew, Babysitters Club, and Sweet Valley Twins/High. I was a Hardy Boys fan. I think I still have a lot of them stored in the back of my closet. I don’t really remember…family says I taught myself to read even before I started school…earliest one I remember is The Little Prince, in French. Oh, I liked the “Pat the Bunny” book…I do remember that!